I turn my lights on at four these days as we approach the shortest day. The light is quite useful to unearth wobbles and irregularities. I have now stood the whole sculpture upright for the first time and am concentrating my efforts on those areas that will jump out. The parts in between the shapes are far from perfect and will always be a bit rough as they are so difficult to reach. Luckily they are also difficult to look into. Today was beautiful, still and clear; lovely. The wildest weather we have had hit us yesterday. My shelter offered very little protection as the wind swirled the rain in any direction it fancied. At about 2pm a gust scattered a makeshift roof I had made over some timber. The four railway sleepers that were keeping the sheets in place were not sufficient. Some wind! Anyway despite the onset of trenchfoot I made some progress and the forms are getting more regular. I must be careful not to break this piece as I near its completion as the cutting away of the parts inaccessible to the grinder is done with a chisel. The shock can be enough to break the piece. I may have to grind with a very small tool instead to minimise the risk. A soggy day today but good progress bringing out the shapes. I should probably rounded the length before starting to develop the individual segments, rather than leaving it hexagonal. Silly to proceed in the wrong order but I do not suppose it will matter in the end. The spaces in between the forms will be very difficult in a few days time. Knuckle busting gaps; my favourite! There is an interesting line of exploration going here. I like lots about the last piece. Those almond nut forms are very sharp and animated. I now want to try something similar with an extra twist on the thin end and to soften the segments down. Looking at the sculptures I have done I like some of the round segments multiplying more gently than the last piece. That is what I am thinking at the moment, I shall probably change my mind. For the moment however there is plenty of work to do chopping the overall shape out. Today has been a day of sanding by hand. Cleaning up those areas where there are wobbling edges or hollows in a form that should be convex. These are the little things that sharpen up a piece and make it talk. Time spent ironing out these things is rarely wasted. I quite like to go over the sculpture with a pencil and make marks on all the problem spots. I can then address them one by one. I am hesitating about how to treat the bottom segment. I designed it to be a segment in the almond pip shape of the rest of the sculpture but I am now wondering if it would be better to leave it rectangular; more or less as it is. It was lovely to stand this piece up for the first time. Fairly easy now that most of the weight has been removed. I am still excited about where this sculpture is headed. A painter friend, Peter Stiles came by and came to look at my recent works. He immediately talked of stacking and how Picasso had done a lot of painting where angular forms would seem to stack upon one another. Braque too comes to mind. I had not thought of any of this. The stacking that I am doing is arrived at in a quite different way, the forms have always been repetitions of each other and the changes incremental. It is interesting however to have this reference in my mind, thanks Peter. I recommend that you check out his paintings. This is a bit of a brain teaser. The almond shapes twist round and fan out like a deck of cards. I have begun to uncover the forms carrying out one cut on each form and then repeating it until all the forms have received the same treatment. Reaching inside the hole will be most awkward but can be left until most of the outer more accessible forms are well advanced. 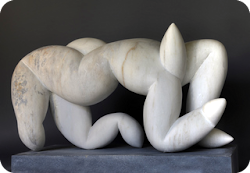 This sculpture is more figurative than most of the sculptures in this series. By this I mean it is closer to a natural form rather than actually looking like a figure. I generally do not like to come too close to representing something in the natural world. I prefer the sculptures to stand a little more apart. I am all excited as a new block is underway and feeling as if it should work really well. After a couple of hours this morning cleaning up the last traces of yesterdays mistake I moved straight on to a new smaller block. I had to drive the Matbro up into the field to get it making a colossal muddy mess in the process. Putting a new block on the work table can bring on terrible jitters, indecision, and; on the edge of a cold pool nerves. It has done so to me before a hundred times. I have noticed that things tend to work out better when I am less fearful but it is far easier to say than do. Like telling yourself not to be nervous on a blind date. Today however a new idea emerged and has evolved into what you see today. A couple of months back I carved a circular sculpture divided into segments that radiated outwards but at an angle. I am going to try a wobbling vertical version that bends round on itself. A wild day today with the wind whirling around the yard making it hard to get out of the way of the dust. I made excellent progress on the fourth side until disaster struck half way through the afternoon with the sander snatching at a corner and breaking of a chip. My heart sank as at first sight it looked pretty disastrous, but after consideration I was able to re-work one section and carve the break out. You have to be very careful when working close to an edge as it is easy to come a little too close to that edge and for the sander to ‘grab’ as it did today. You can just about make out the remains of my mistake at the left hand end of the fourth row from the bottom. Tomorrow I shall sand out the error completely. No one will ever know ( except you and me). Mmm, turning this piece around is very challenging. Why do I do this to myself? The problem is that when I roll the marble over all the weight is in a couple of little points for a moment. Once the sculpture is complete however I will no longer have to roll it. How the nights are drawing in. I have to get my light into action at about three o’clock as the gloom is getting too much. Although it was a wonderful sunny day today, the temperature plummeted as soon as the sun disappeared.